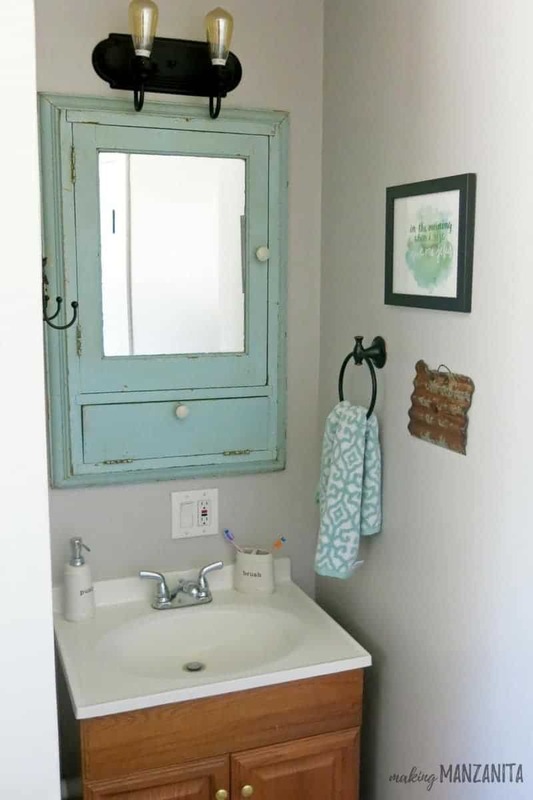 If you’re needing to add some instant charm when decorating your bathroom, consider adding a vintage medicine cabinet for farmhouse bathroom charm. We recently had an exciting reveal of our farmhouse master bathroom. If you’re wondering, yes it’s possible to be in love with a bathroom. Today is one of my favorite days of the month…it’s Thrift Store Upcycle day! 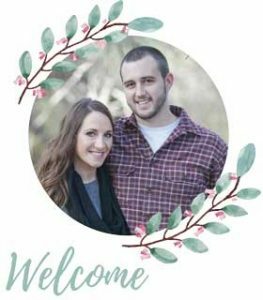 Each month a group of amazing bloggers come together and show you what we’ve been upcycling from thrift stores lately. I get so inspired after clicking around and seeing what everyone else came up with. My project today isn’t as much of an upcycle as it is an incredible story behind a vintage piece that I gave new life in our bathroom. If you’re needing to add some instant charm to your space, consider adding a vintage medicine cabinet for farmhouse bathroom charm. 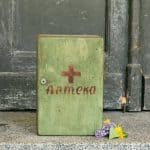 This vintage medicine cabinet post contains affiliate links, but nothing that I wouldn’t wholeheartedly recommend anyway! Read my full disclosure here. One thing that definitely needed to be replaced in our farmhouse master bathroom was the ugly & tiny medicine cabinet. It stuck out from the wall (Please tell me WHY someone would not just wall-mount it?). It was so small, it barely provided any storage. Lastly, it wasn’t doing anything for us design wise. I seriously looked at mirrored medicine cabinets online for ages and started getting really frustrated with all the choices there were out there. I have the same problem trying to buy things at the grocery store. Guess I hate making decisions, haha! Does an aisle full of 2,576 types of pasta sauce overwhelm anyone else?! #FirstWorldProblems for sure, I know. I had all, but given up finding a new medicine cabinet for our farmhouse master bathroom. I was THIIIIS close to telling my husband that he could chose whatever cabinet he wanted because I just couldn’t decide. That’s when I stumbled upon this old thing at my fave antique store and FELL IN LOVE. 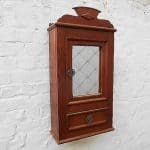 This vintage medicine cabinet was so perfect with it’s character and all. Wanna know the best part about this vintage medicine cabinet?! It had a story! I LOVE buying old things with stories. It’s one of the reasons I buy vintage items. The shop owner told me that the person who brought it in had originally bought it from the same antique shop owner 20+ years ago (and it was considered an antique even back then) with dreams of installing it in his house. Sadly, it sat out in a barn all these years and never got used. When the person found it again, he decided to bring it back in to the same antique store so the shop owner could sell it to someone else. I’m so glad we could give this piece some life again. 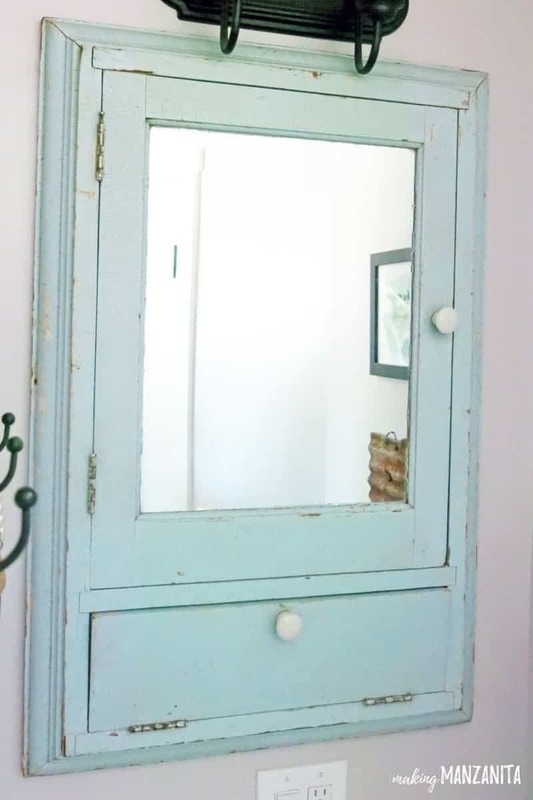 I grabbed this vintage medicine cabinet for $70 (WHAT A STEAL, RIGHT?!). All of that light mint chippy paint farmhouse charm was there already, in fact that beautiful color inspired the decor around the rest of our farmhouse bathroom. All we did was give it good wipe down on the outside. For the inside of the vintage medicine cabinet I used a bleach and water combination to clean it up because it was pretty dingy. For the corners, I used a Q-tip. If you’re planning a farmhouse bathroom, installing a vintage medicine cabinet is a great way to add farmhouse charm. 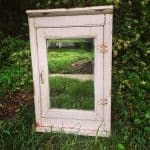 You will probably be able to find a vintage medicine cabinet for farmhouse bathroom if you start searching at your local thrift store, antique stores, CraigsList and yard sales. 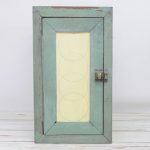 If you’re having trouble finding a vintage medicine cabinet, Etsy is another great place to find tons of vintage items. Just look at all these pretty vintage medicine cabinets! The video of our shiplap wall and floating shelves in our farmhouse master bathroom literally went VIRAL. It was even shared by BHG, Jordin Sparks and Scott Dudick. It’s been so cool to see something that we did get noticed by SO many people. If you are not one of the 20,000,000 people that saw this on Hometalk’s Facebook page, here’s a little time lapse version of our farmhouse bathroom transformation! I love that chippy paint finis–such an amazing find! It’s so cool that your medicine cabinet came with a story–and that color!! I looove that color. The rest of your bathroom looks fabulous too! Your perseverance paid off. Tne vintage medicine cabinet adds such charm. What an amazing find! I love t too! Chippy and all! Love that fun pull down drawer on the bottom. What an amazing find! This piece is perfect in that space. Love that little drawer on the bottom too. For heaven’s sake, show us what the inside of that beauty looks like!!!! I LOVE it! All that chippy paint goodness. What does that little pull out thing reveal? On the bottom? Loved your story of finding it too. That is so darn cute. BTW, I’m Florence with the white planter turned upside down. First time in the Challenge. Hi Florence! Yes, I totally need to grab some pictures of the inside…it’s just kind of..well, messy. It IS a medicine cabinet. Haha. I’ll try to remember to add some. The door on the bottom folds down and is an extra little shelf. I keep my makeup and lotion there. Much more in keeping with your style! Lovely! I’m curious to see what the inside of the cabinet looks like. Love how it turned out! The crackled look works really well and adds that special vintage feel! Your bathroom looks great! 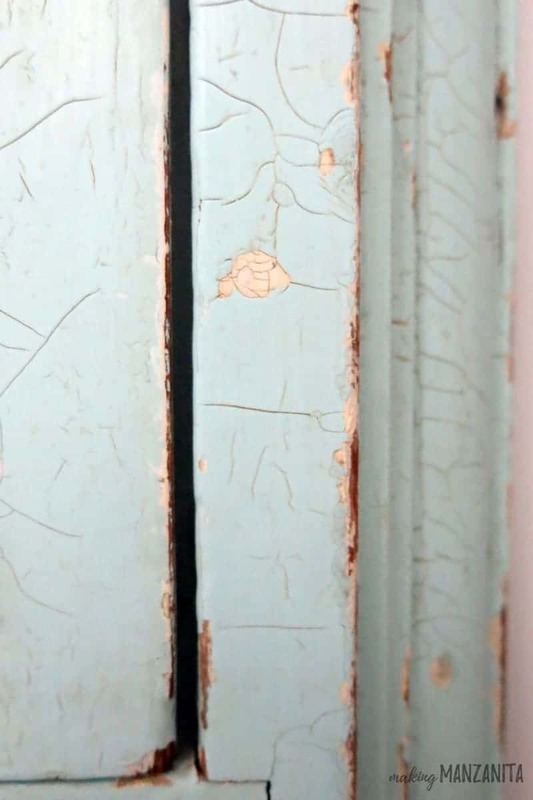 I love the crackle finish on the cabinet and the color! Wow! This is so nice. The whole bathroom is ahh-ma-zing! I wish I could find a little cabinet like this. It fits perfectly and is the perfect color. 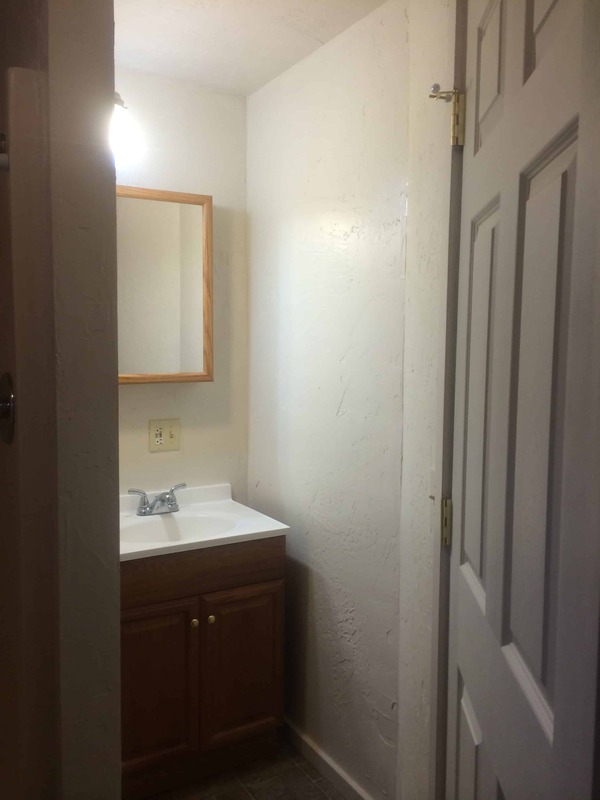 You guys did such a great job on your bathroom. I went over and looked at the reveal page too. I love it! Love the cabinet, but it would be GREAT to see what the inside looks like since building one (for some of us) would be the way we would have to go. Love that color! Maria, I hear ya loud and clear. Some other have requested photos of the inside too, so I’ll be sure to take some over the next couple of days and update this post. I didn’t do it originally because it’s not “pretty” inside but I understand wanting to see it! 🙂 Thanks for your comment.